An Oldowan core pulled from the Ain Boucherit site. The discovery of 2.4-million-year-old stone tools and butchered bones at a site in Algeria suggests our distant hominin relatives spread into the northern regions of Africa far earlier than archaeologists assumed. The find adds credence to the newly emerging suggestion that ancient hominins lived—and evolved—outside a supposed Garden of Eden in East Africa. This extraordinary discovery can be traced back to 2006, when Mohamed Sahnouni, the lead author of the new study and an archaeologist at Spain’s National Research Center for Human Evolution, found some intriguing artifacts at a site called Ain Boucherit in northeastern Algeria near the city of El-Eulma. These items were embedded in a sedimentary layer exposed by a deep ravine. Two years later, Sahnouni found another layer at the site, one even older. From 2009 until 2016, his team meticulously worked at Ain Boucherit, uncovering a trove of stone tools and butchered animal remains. Using multiple dating techniques, Sahnouni and his colleagues dated the two stratigraphic layers, dubbed AB-Up and AB-Lw, at 1.9 million and 2.4 million years old, respectively. The items within these two layers are now the oldest known artifacts in North Africa, the previous oldest being 1.8-million-year-old stone tools found in the late 1990s at a nearby site called Ain Hanech. 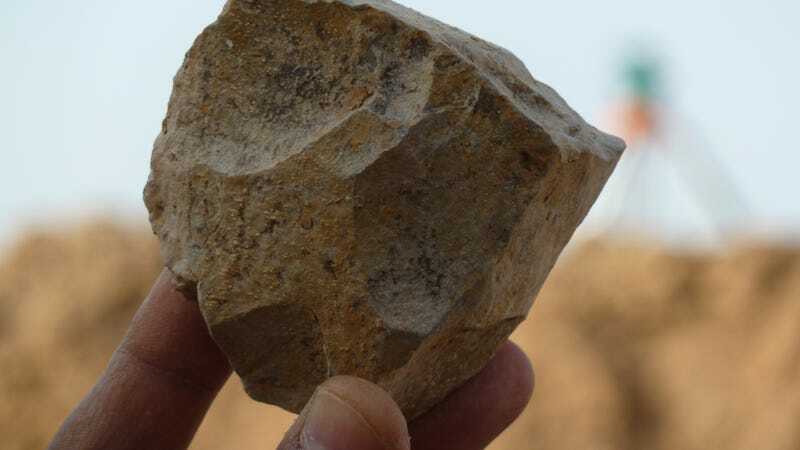 The tools found within the AB-Lw layer, at 2.4 million years old, are 600,000 years older than the ones found at Ain Hanech, and 200,000 years younger than the oldest tools found in East Africa (and the world, for that matter)—the Oldowan tools of Gona, Ethiopia, dated to 2.6 million years ago. Scientists used to believe that early hominins evolved in this area of Africa, spreading to the north around a million years later. But this finding now suggests a much earlier dispersal date into the continent. To put these dates into perspective, our species, Homo sapiens, emerged 300,000 years ago. So the unknown hominins who built these tools were romping around eastern and northern Africa some 2.3 million years before modern humans hit the scene. The new discoveries at Ain Boucherit, the details of which were published today in Science, suggest North Africa wasn’t just a place where human ancestors lived and developed tools—it was a place where they evolved. Jean-Jacques Hublin, a researcher from the Max Planck Institute for Evolutionary Anthropology—also not involved with the new study—wasn’t thrilled with the dating techniques employed by Sahnouni and his colleagues. Fair enough. These are indeed extraordinary claims, so an independent effort to date these layers and the artifacts would support the study’s conclusions. Cut marks consistent with butchering. In terms of the animal bones discovered, the archaeologists found traces of mastodons, elephants, horses, rhinos, hippos, wild antelopes, pigs, hyenas, and crocodiles—oh my! Clearly, these ancient hominins weren’t picky eaters. Importantly, many of these animals are associated with open savanna environments and easily accessible bodies of permanent freshwater. This likely describes the landscape inhabited by these Oldowan hominins at the time. Analysis of the fossilized bones revealed characteristic signs of butchery, such as V-shaped gouges involved in evisceration and defleshing, and impact notches suggestive of marrow extraction. Ain Boucherit is now the oldest site in North Africa with tangible archaeological evidence of meat use in conjunction with the use of stone tools. Moving forward, Scerri hopes that scientists will make a more concerted effort to explore the allegedly “less important” regions of Africa to obtain a more accurate—and real—picture of hominin evolution over time.